A growing subscription business and the faster pace of cybersecurity spending will be long-term tailwinds for Check Point Software Technologies. 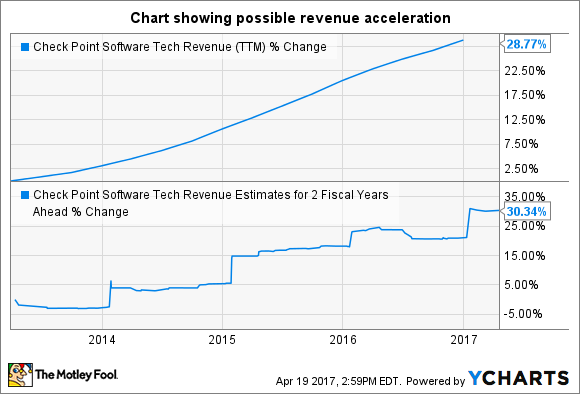 Check Point Software Technologies (NASDAQ:CHKP) stock has enjoyed a terrific run this year, rising over 20%, sparked by a solid fiscal fourth-quarter earnings report in January. The cybersecurity specialist's guidance indicates that its consistent growth will continue in 2017 as the subscription business gathers more momentum. Check Point Software is a long-term play on the cybersecurity opportunity, as the industry could be worth $120 billion this year and continue growing at an impressive pace in the long run. The need for cybersecurity will get bigger as corporations and governments try to stop data breaches and losses. A Check Point study found out that all consulting companies, 86% of government organizations, and 81% of retailers and wholesalers had seen a data loss event. A Mozy Enterprises study puts the cost of a typical data-loss event at over $400,000, and this is just one of the ways a cybersecurity slip can cost a company. Not surprisingly, Markets and Markets expects cybersecurity spending to double during the 2015-2021 period, up from a compound annual growth rate of 5% from 2011 to 2015. Check Point Software's top line has risen substantially in the past four years thanks to end-market expansion. Therefore, it won't be surprising if its revenue growth accelerates, as cybersecurity spending increases at a faster pace in the coming years. Check Point Software's subscription business has been growing at an impressive rate, accounting for 23% of its total revenue. Data from Check Point's SEC Filings, Chart by author. Figures in millions. Growing subscriptions have substantially boosted Check Point's revenue and helped it to maintain its gross margin at an impressive 88% over the past three years despite a 15% bump in the cost of revenue, ensuring a steady revenue stream without any additional customer-acquisition costs. More importantly, the booming subscription business boosted the company's deferred revenue to $1.06 billion at the end of last year, up 36% from 2014 levels. Deferred revenue, which has yet to be recognized on the income statement, though the company has already collected it, should continue to grow as the company struck $1 million-plus deals with 99 customers in the fourth quarter, up 15% from the prior-year period. In addition, the company's average ticket size is getting bigger, with a 4-percentage-point increase in $50,000-plus transactions, which accounted for 76% of its total orders. Moreover, Check Point has started providing security solutions to Alphabet's Google Cloud Platform, whose customers can use the cybersecurity specialist's vSEC cloud security product on a pay-as-you-grow basis or buy the license from the Google marketplace. More importantly, Check Point's security solutions will help it take advantage of GCP's planned expansion into 10 new regions. A lot of GCP customers are interested in using the cloud for artificial intelligence and machine learning applications, and the scalable nature of Check Point's vSEC platform for high-performance applications makes it a good fit. Check Point Software is growing where it counts by driving stronger subscription sales through key partnerships, which should fuel strong long-term growth.